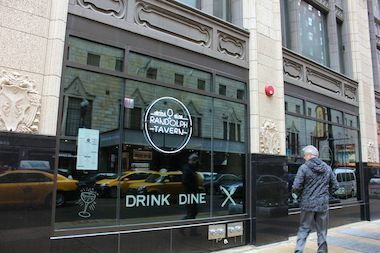 Randolph Tavern hopes to open May 10 at 180 W. Randolph St. THE LOOP — A new restaurant is expected to join the Loop dining landscape May 10 at Randolph and Wells streets. Randolph Tavern at 188 W. Randolph St. will be restaurateur Rachel Dennis' first Chicago project, joining her existing Lake Street Kitchen + Bar in Oak Park and Piggyback Tavern in Forest Park. The menu is "American with a spin," general manager Neil O'Mara said. "We're hoping to have a little bit of something for everyone," said O'Mara, a Jefferson Park resident who's worked with Dennis in each of her restaurants. "We're going to have tacos on the menu, and burgers and steaks, seafood, raw oysters. Chef Will Pagulayan, from One North, designed the entire menu, and he's knocking it out of the park." The restaurant will seat 300 and include a "giant" bar that seats 50 more, O'Mara said. It will be open five days a week for lunch and happy hour and for dinner only on Saturdays and Sundays, though O'Mara said that may change depending on demand. Lunch prices will range from $10 to $25 for entrees, and from $10 to $35 for dinner. O'Mara will head up the beverage program, with a little help from his friends. "Me and a couple of my friends are experienced mixologists, so we've been putting our heads together," he said. The drinks menu will include "a combination of classic Prohibition-era cocktails and original creations" like a "balsamic sea salt gin smash, which sounds odd, but it's very, very good." O'Mara said he planned to promote internally to staff the management team, and he and Dennis "cannot wait to open. We have an amazing location in the Loop, arguably the best location in the city."